The Skookumchuck River is a 45-mile long river located in southwest Washington. It is a tributary of the Chehalis River and thence to the Pacific Ocean. 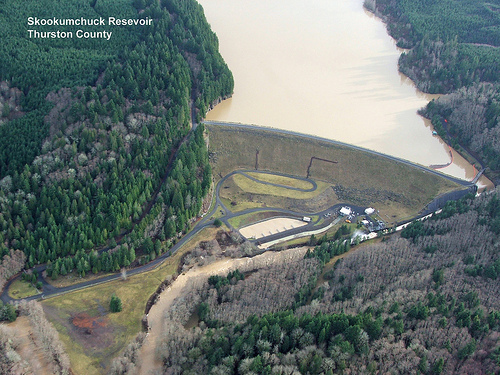 The Skookumchuck Dam was built in 1970, creating the Skookumchuck Reservoir. The dam provides water supply for the 1400-megawatt Centralia Steam Electric Plant and supplements flows for fish resources. The river begins with several tributaries in the Snoqualmie National Forest in the foothills of the Cascade Mountains, and flows west past the town of Bucoda, Washington to its confluence with the Chehalis River near Centralia, Washington. The name of the river derives from Chinook Jargon: In this context, “rapids”. The word skookum means “strong”, and chuck means “water”.We will be doing a service project along the roads of the dam on Saturday followed by some Canoeing and Kayaking on Saturday and Sunday (completed swim test necessary to go on the water). GEAR: Normal Camping Gear. Gloves for Trash Pickup.